Back in the early 1990s, I attended a meeting to help try establish some standards for muzzleloading, including standardizing bore sizes. Knight Rifles, Thompson/Center Arms, Connecticut Valley Arms, and other major muzzleloading rifle manufacturers or importers were there, and so were four or five muzzleloading bullet makers. And, I am sorry to say...Not much ever came of that meeting, other than the realization that the muzzleloading industry is the most non-standardized segment of the shooting and hunting industry. Back then, in 1993, rifles sold as ".50 caliber" had bores ranging from as tight as .499" (Gonic) to as loose as .504-.505" (White Rifles). And that much variation had created quite a dilemma for those manufacturing bullets for the so-called .50 caliber muzzle-loaded rifles - or for the .45 & .54 caliber rifles at that time as well. This was especially true with "bore-sized" bullets. 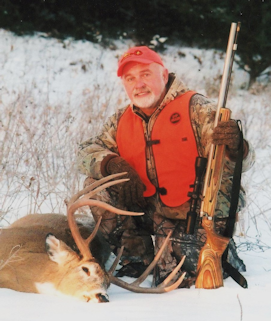 The saving grace of this era of muzzleloader development was the plastic saboted bullet. The resiliency and compressability (new word) of the polymers used to produce sabots made it possible to use the same sabot and bullet combinations in various diameter bores - that is, within a reasonable variation of bore diameters. The fact remained that, at that time, a sabot that fit tight enough to be shot with some degree of accuracy from a .504" White Rifles bore could not even come close to being forced into a .005" smaller diameter .499" Gonic Arms .50 caliber rifle. Likewise, the sabot and bullet combo that loaded properly in the tighter bore would literally fall down the looser bore. 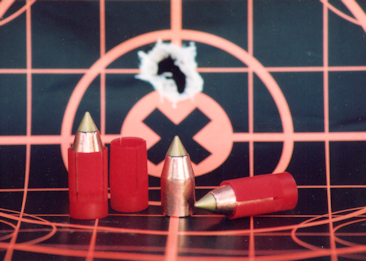 Shot from a .502-.503 bore, the tighter fitting red .50x.45 "Crush Rib" Sabot and 300-grain "Scorpion PT Gold", propelled by 120-grains of Blackhorn 209, punched the very impressive 1-hole 3-shot group shown. In regard to the variations in the diameter of .50 caliber bores of various modern in-line rifle makers, things have gotten somewhat better. And that's mostly due to those companies that were at the outer edges of what was considered a "nominal bore" diameter not selling enough rifles to remain in business. Still, today's popular .50 caliber fast-twist sabot-shooting bores can vary in diameter as much as .002" to .003" - from the same manufacturer, thanks to wear on the tooling used to produce their barrels. The .50 caliber rifles produced by Knight Rifles all feature Green Mountain barrels, and are some of the closest tolerance muzzleloader barrels produced today. Typically, a .50 caliber Knight in-line ignition rifle will have a bore diameter of .500" to .501". And on rare occasion, a rifle may leave the factory with a bore closer to .502". Thompson/Center Arms .50 caliber barrels are typically .501-.502", with some .50 caliber bores pushing .503". Traditions, CVA and MDM .50 caliber bores generally run .502-.503". And depending on the hardness of the steels used, by about a thousand rounds most of these barrels will show a minute amount of wear - opening, maybe, another .001". Now, .001"....002"....003" isn't much variation when looking at the gap between the jaws of a set of calipers. In fact, you have to hold it up in front of a bright light to even see an extremely slight gap of .002" between those jaws. But that small amount of difference can make all the difference in the world when trying to obtain optimum accuracy with a saboted bullet - that you are trying to get to group inside of a 2-inch circle at the distance of a football field. The .50 caliber Knight "Long Range Hunter" I shoot and hunt with more than any other muzzleloader has a bore that's right at .501". This rifle loads relatively easily with the Harvester Muzzleloading .50x.45 black "Crush Rib" Sabot and a .451-.452" bullet. Shooting my favored 260- or 300-grain "Scorpion PT Gold", propelled by a 110- or 120-grain charge of either Blackhorn 209 or FFFg Triple Seven, the rifle will consistently keep groups inside of 1 1/2 inches at 100 yards - often tighter when the operator (me) is up to the task that day. 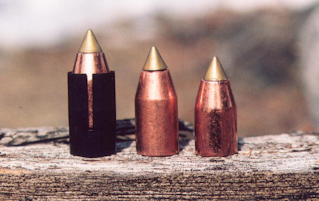 The 300-grain "Scorpion PT Gold" (far right) is shown here with a prototype 350-grain version of the bullet, to be available soon. 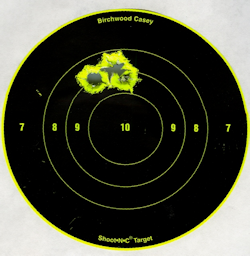 Last fall (2008), I helped another shooter sight in his well used .50 caliber Knight DISC Extreme model. He was impressed by the accuracy of the Green Mountain barrel of my rifle, and wanted to shoot the same load. With the same powder charge, sabot and bullet, and with the same exact scope (Hi-Lux HPML) as on my rifle, the best we could do was to get the poly-tipped 300-grain "Scorpion PT Gold" to group inside of 2 1/4 inches. But, during loading, I noticed that the black "Crush Rib" and .451" bullet tended to load noticeably easier. I surmised that the bore was .001-.002" larger - so switched to the red .50x.45 "Crush Rib" Sabot. This particular sabot is several thousandths of an inch larger in diameter, designed for maintaining more compression of the smokeless powder charges shot out of the Savage Model 10MLII muzzleloader. The slightly tighter fit, which still loads easily due to the "Crush Rib" design of this sabot, made all the difference in the world. Shooting 110-grains of Blackhorn 209 and the 300-grain "Scorpion PT Gold" (with the red .50x.45 sabot), we had his rifle punching 1 1/4 to 1 1/2 inch groups in short order. When time is taken to find the optimum powder charge and optimum bullet-sabot combination, today's in-line rifles are capable of this degree of accuracy. This groups was shot with the black .50x.45 "Crush Rib" Sabot and 300-grain "Scorpion PT Gold" - out of a Knight .50 "Long Range Hunter". Another .50 caliber rifle I shoot often is one of the MDM break-open "QuicShooter" Magnum models. The bore on the rifle I have runs between .502 and .503". And the rifle shoots well with the black .50x.45 "Crush Rib" Sabot and .451" diameter "Scorpion" or "Scorpion PT Gold". Typically, groups with the latter in 300 grains will be inside of 1 1/2 inches at a hundred yards (ahead of 110-grains of Blackhorn 209 or BlackMag 3). After seeing the big improvement with accuracy in the aforementioned .50 Knight DISC Extreme when switching to the slightly tighter fitting red .50x.45 sabot, I gave them a try in the "QuicShooter" Magnum - and discovered a rifle fully capable of punching sub 1-inch groups. The MDM break open "QuicShooter" Magnum has a .502-.503" diameter bore, and performs best with the slightly over diameter red .50x.45 "Crush Rib" Sabot. If you are just so-so pleased with the accuracy you are now getting with your .50 caliber in-line rifle, especially if the groups you are shooting are running 2 to 3 inches at a hundred yards, maybe it's time to do some experimenting. A good start may be to run down to a local machine shop and see if you can get them to measure the land-to-land measurement of your bore. Knowing the exact bore size will help you choose the right Harvester Muzzleloading sabot. If the bore runs .500-.502", the black .50x.45 sabot may be the one you need to be loading with. If the bore runs .503-.504", chances are the red .50x.45 "Crush Rib" sabot will help tighten those hundred yard groups. Experimenting to find the optimum sabot and bullet combination for any particular rifle is half the fun of owning...shooting...and hunting with a modern in-line rifle. One combination I am looking forward to doing more with in the future is a new .458" diameter 350-grain "Scorpion PT Gold" that Harvester Muzzleloading is looking at bringing to market. I've been loading and shooting prototypes of the big bullet in my Knight "Long Range Hunter", shooting 120-grains of Blackhorn 209, and have found one hard-hitting elk combination that shoots well under an inch at a hundred yards with regularity. While the black .50x.45 "Crush Rib" Sabot has been designed to be loaded with a .451-.452" diameter bullet, it still loads well with the .006-.007" larger diameter .458" bullet. In fact, it loads easier than Harvester Muzzleloading's competition .451-.452 bullets when using their non-ribbed sabots.